Shironeko is a pleasantly plump, 10-year-old Van Cat who lives in Japan. His exact location is unknown as his owner wishes to maintain their privacy. Shironeko's name translates as “White Cat” though his distinctly relaxed personality sets him apart from other cats who've achieved Internet stardom. 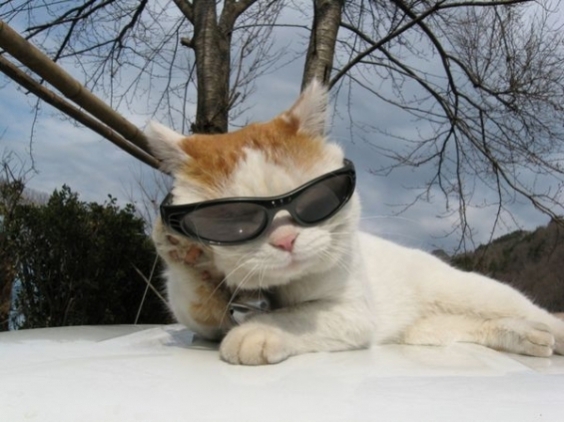 In fact, Shironeko topped BuzzFeed's The 30 Most Important Cats of 2011 list. 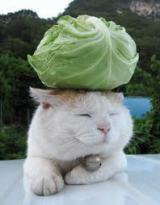 Jack Shephard of BuzzFeed dubbed Shironeko “The Most Relaxed Cat In The World”... who else would allow his owner to place baskets, vegetables and more on his head time after time for photographic purposes? Shironeko has been amusing and delighting the world's pet-loving netizens since April of 2006 when the Japanese blogosphere first began circulating his offbeat images off his smash-hit Shironeko Blog. 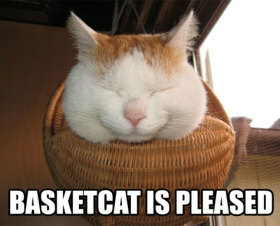 The popular website Cheezburger.com introduced Shironeko to a much wider audience in April of 2007, referring to him as “Basket Cat”, and in June of that year Shironeko's official YouTube site launched: as of March 2012 the channel boasts 29,386 subscribers and has gained more than 24 million upload views. Not bad for a cat who seems to be asleep most of the time! Naturally, Shironeko's legions of loyal fans have been buying up anything and everything featuring the face, photos and antics (if you can call them that) of this eminently contented cat. One product has been conspicuous by its absence, however: Shironeko stuffed animals! Until now, that is. 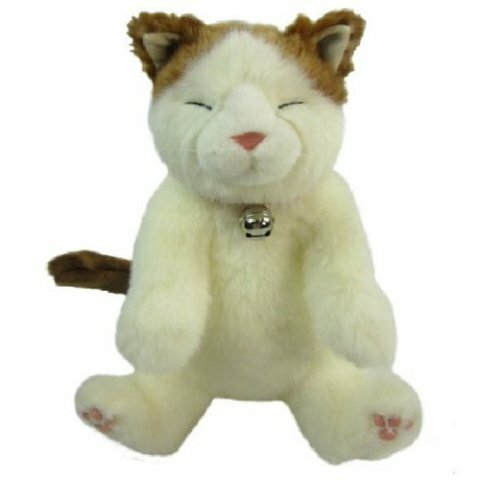 An official Shironeko plush was released on March 26th, 2012 though Amazon Japan has listed it on a pre-order basis beginning February 29th, 2012. The stuffed animal is modeled after Shironeko in a sitting position, eyes squinted nearly shut, his collar featuring his customary round metal bell. Specs on the Shironeko plush mention it weighs 426 grams (just under 1 pound) and stands 33cm (13.2 inches) tall. It's Made in Japan and is recommended for children (and adults) 6 years old and up. For this next spec, YOU'D better be sitting: it lists for 13,440 yen, or approximately $164 using a 82 yen/1$ exchange rate. Oh, the price of fame! Still want to buy a Shironeko stuffed toy? Don't fret about additional shipping costs because Amazon won't ship the pricey plush puss outside Japan. You'll either have to go there, have your purchase shipped to a domestic Japanese address, or contact the English-speaking folks at Rinkya Stores and ask if they can act as middle-men. 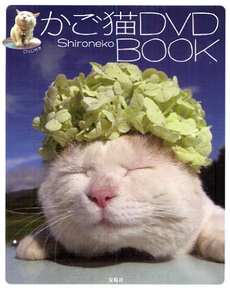 In the meantime, Shironeko fans & fanatics can stock up on Shironeko DVDs, digital cameras, photobooks, 2012 calendars, birthday cards and jeweled Swarovski charms. Go ahead, knock yourself out! If you are just looking for a super cute stuffed cat, perhaps this gorgeous Siamese, cute Calico, or pretty Angora stuffed cat can help keep you company while you wait.